Another wonderful recipe to use U.S. Farm-Raised Catfish in - I recently cooked this on WABG's Delta Kitchen. It's perfect for football season! I can't believe it's already here..... Go Dawgs!!! 1. Chop catfish into 1⁄4-inch pieces. Combine catfish, 3⁄4 cup breadcrumbs, and next 5 ingredients; gently stir until well blended. Shape mixture into 12 patties (about 1⁄4 cup each). Dredge patties in remaining 1⁄2 cup breadcrumbs. 2. Cook patties, in batches, in hot oil in a large nonstick skillet over medium heat 3 to 4 minutes on each side or until golden; drain on paper towels. Garnish, if desired. *11⁄4 cups fresh breadcrumbs may be substituted. ** At Lauren Farms we used store-brand unseasoned breadcrumbs in the mixture. We dredged the cakes in panko bread crumbs. The panko give a delightful, crisp coating. 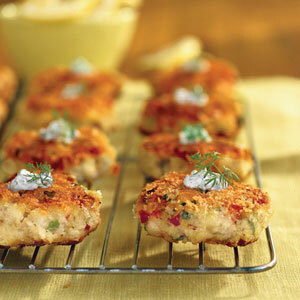 If you can’t find panko, don’t stress – these catfish mini cakes are truly delicious!